Whew! Finally, it’s back to business after a family trip to Disneyland, a visit from my cousin Mike, his wife Donna (tbf of the blog, by the way) and their adorable twin girls, my birthday festivities, and Easter. Geez, I don’t think I’ve been away from the blog for a two week interval since it started. I can feel it, too; my funny bone’s a little stiff after that much time off. Give me a minute to stretch it out…. Okay, well, I guess it’s about as loose as it’s going to get. Let’s move on, and maybe I can work it back into shape along the way. Going to Disneyland is a pilgrimage our family makes, on average, about once every two years, which is just about long enough to ensure that there are always several new things to see sprinkled in amongst the old favorites. 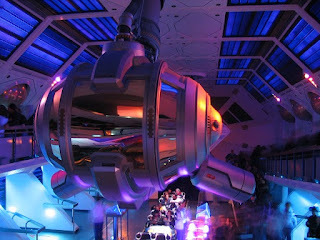 This time, that included the revamped Star Tours attraction (finally, the ride as it should have been from the beginning!) in Disneyland, as well as two in California Adventure: the Little Mermaid ride (cute and cleverly imagineered, and very much a Disneyland-esque ride, which I think reveals a lot about the direction that California Adventure seems to be heading; maybe we can talk more about that later), and the World of Color water show in Paradise Bay (the sort of thing you can just imagine Walt himself gleefully announcing on his old TV show - it makes the “Dancing Waters” of the Bellagio in Vegas seem like a long row of sadly deluded drinking fountains). I have a head full of things to write about after visiting the conjoined theme parks. I’m not sure how many of them will see the light of day as blog posts, but I do know which one I’d like to start with: my list of 10 great Disneyland moments. 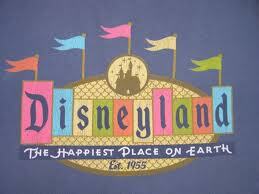 So what is a great Disneyland moment? For me, it’s when the kid in you comes out again to play after a lengthy grounding. It’s about losing yourself in the pure fun and wonder and enjoyment of life, and then the sudden awareness and appreciation of the fact that you can still lose yourself in that way. It may come from a ride, from an iconic character, or a certain place in the park, but they all generate special, signature feelings that you just don’t get anywhere else. You may or may not agree with the ten I’m putting out there, but then that’s half the fun of a list like this. Let the discussion begin! I think most people who go to Disneyland experience what I like to call the “Mickey Moment.” This is the first of many great moments and it comes, naturally enough, as you first enter the park. No matter how far you’ve come, how many problems, reversals, delays, or complications you may have experienced along the way, no matter how long you’ve waited in line that morning for the park to open, it’s impossible not to feel a certain thrill of elation once you’ve pushed past the turnstile and you get that first completely unobstructed view of Mickey’s mighty mug. It’s the thrill of knowing there is no longer anything standing between you and all the magic contained within those legendary walls. As difficult as it may seem, resist the urge to join the fifty thousand other people who are streaming by you to get to the rides. Take a minute and savor this unique blend of unfettered joy and anticipation. You made it; you are there. Enjoy the Mickey Moment. 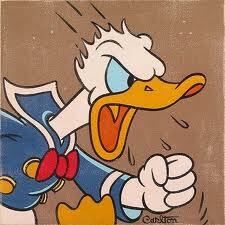 There’s another great moment that follows quickly on the heels of the Mickey Moment, but it can be an easy one to miss. It occurs when you reach the crossroads of the park at the end of Main Street, the big circle where Walt and Mickey’s statue stands at the center. From here, paths lead you to all the different lands of the park. This is where the first real decision must be made: where to go first? The young and foolish come into Disneyland with a predetermined plan of attack already set in their heads (I know because for a long time I was one of them): Okay, we’re doing Space Mountain first, then we’ll get FastPasses for later, then we’ll do Star Tours, then either the Matterhorn or Thunder Mountain, depending on the line, then we’ll use our Space Mountain FastPasses, then get FastPasses for Indiana Jones… However, partaking of this great Disneyland moment requires abandoning any calculated agenda. Instead, stand somewhere in the vicinity of that central circle and simply absorb the panorama that surrounds you. Let yourself feel the little rushes of excitement, the irresistible siren calls of each area. Allow yourself to be pulled in all directions at once, while blissfully contemplating the fact that there are few moments in life when you will have so many great choices before you, and so few, if any, bad ones. Unless, that is, you’re with the young and foolish, and you make them go to Fantasyland first. That is one of the few known ways to ruin a trip to Disneyland. For a very long time, Pirates was my favorite ride at Disneyland. Then the movies came along and somehow diminished my enthusiasm for the ride. I really don’t know how or why, but the intrusion of Johnny Depp’s Captain Jack Sparrow seems to have upset the surprisingly fragile ecosystem of the ride, at least for me. Why couldn’t they let the ride be the ride, and the movies be the movies? At any rate, what puts Pirates on this list has nothing to do with pirates, or Depp, or any of that stuff; the magic moment here happens at the very beginning of the ride, when you first set off into the Gulf Coast bayou in your brown plastic punt. The sluggish drifting of the boat, the dark, torpid water, the mossy trees, the sounds of crickets and frogs (and yes, even the slow Deliverance-esque banjo picking), the moonlit clouds moving across the evening sky, the elevated humidity, the benignly musty smell, it all works together to transport you instantly to another place. This is quintessential Disney magic: the ability to immerse you thoroughly into an experience even though you know it’s fake. No ride does that more effectively than Pirates, and no part of Pirates does it as effectively as the ride’s dank prologue. 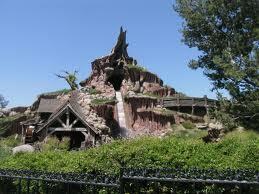 I won’t try to conceal the fact: Splash Mountain is my favorite ride at Disneyland. Much like Pirates, it tells a complete story while delivering loads of fun along the way. 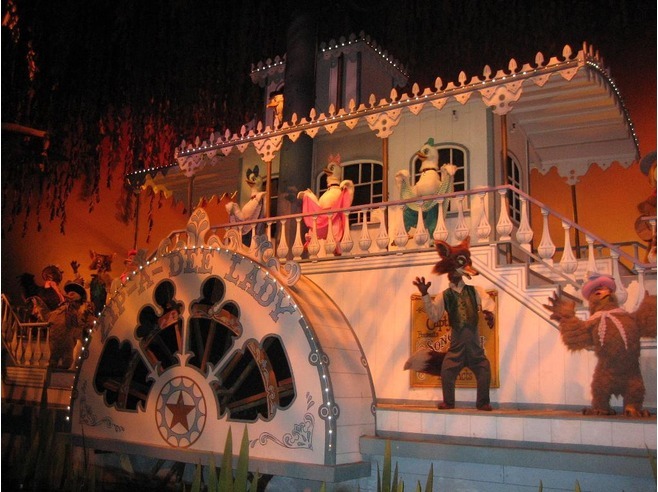 The ride is based on Song of the South, specifically the story of Br’er Bear and Br’er Fox’s attempts to capture the maddeningly elusive Br’er Rabbit. You coast through a cartoon landscape in a simulated hollowed-out log, serenely passing through the community of woodland residents on your way to ‘the laughing place.’ It’s great from beginning to finish. But this list isn’t about great rides; it’s about great moments, and Splash Mountain delivers in that category, too. The big drop in Splash Mountain is a rushing moment that surprises you with its momentary sensation of freefall, almost uncomfortably surprising because you are all too aware of the fact that you’re sitting in an open log, with no safety belt or harness of any kind restraining you. The build up to the drop is great, too; the story takes a threatening turn when it appears that Br’er Rabbit is finally at the mercy of Br’er Fox. You rattle up the final incline under the remorseless eyes of two mocking buzzards before plunging headlong into the briar patch and the dark safety at the bottom. Add in the opportunity to demonstrate your ability to hold a ridiculous pose for the ride’s camera while your stomach tries to crawl out through your nostrils, and a satisfying, though rarely inundating, splash as you bottom out, and the result is a moment that never fails to find my laughing place. I’ve already mentioned that Splash Mountain has a great moment – the big drop, but there is another moment from the same ride that might be just as impressive. Those of you who have been on this ride know what I’m talking about. After you survive the fall into the briar patch, you are rewarded by Splash Mountain’s big finale: the showboat room. In it, all the characters come together to rejoice at Br’er Rabbit’s – and your – successful deliverance from danger. They serenade your safe return from the white-spindled balconies of a paddle-wheeled showboat to the tune of “Zip-a-Dee-Doo-Dah.” The explosion of colorful exuberance as you enter that room creates a moment of pure, celebratory joy that is unrivaled by any ride I’ve ever been on. For old-timers like myself, there is an added layer of appreciation for the fact that the showboat room includes many characters preserved intact from the old “America Sings” attraction (they actually appear throughout the ride), making Splash Mountain the classiest reclamation project since the Hoover Dam. 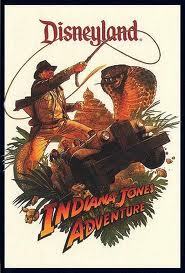 The Indiana Jones ride has grown on me over the years. At first I thought it was too herky-jerky, too constantly jostling for my tastes, plus it went too fast to take it all in. But from the very beginning, I had no trouble recognizing that there was a truly great Disneyland moment sandwiched in between the endless bumps and jolts. It is the boulder drop sequence. The famous big round boulder from Raiders of the Lost Ark is brought back for an encore as part of this ride, and the way the moment is handled is sheer magic. You’re in a jeep-like car that spits and sputters its way through a series of dangers and precipitous encounters in the interior of a lost temple in the jungles of India. Just when it appears that things are beginning to look up, you actually look up and see that boulder steamrolling its way at you. Your vehicle tries to back up, but the engine stalls. For a long moment, it appears as though you’re going to be flattened. The engine flares back to life just in time, but instead of backing up at full speed like you were expecting, the car rolls tentatively forward, hesitates, and then lurches ahead, diving below the boulder at the last possible second into some black tunnel that you could have sworn didn’t exist a minute before. You instinctively duck as the giant rolling rock passes over you, nearly grazing your head. It is a truly thrilling moment of simulated death defiance, and it is simply one of the most ingenious, cleverly designed and deviously effective moments of any Disneyland ride. Space Mountain is a problem for the following reason: although it is a great ride, it doesn’t have an obviously great, signature moment, like Splash Mountain or Indiana Jones. But my wife, Elizabeth, pointed out that it does have a great moment, just not necessarily where you’d expect it to be for a thrill ride. We are both old enough to remember the days before FastPass, when waiting in line with everybody else was your only option. Sometimes those waits were measured in hours, as they always seemed to be at Space Mountain. To make matters worse, much of the waiting occurs in the narrow, claustrophobia-inducing passageways that switchback endlessly inside the building. On a busy day, it is possible to spend an hour or more packed into these tunnels, moving a few precious feet forward every minute or so. You inch your way towards the front, clinging to the hope that the next turn will be the last one, that you’ll make it through without passing out, and that it’s not you who smells like they haven’t showered recently. Finally you step through a portal into the big launch room. All of a sudden it’s right there before you: the remainder of the line as it winds along the perimeter of the room down to the boarding platform; the laughing, wild-eyed riders returning almost below you; the enormous mock spaceship suspended from the ceiling, indicating the direction your rocket sled is going to launch. All the bored slouching of the last hour or two vaporizes, and you snap back into shape like the old theme park soldier you are. There is an electricity in this room that is tangible; everybody feels it, and each person adds to it. That’s the great moment of Space Mountain: emerging from dull tunnels into that powerful mélange of highly torqued anticipation, adrenaline, nerves, and excitement. Others rides may produce similar sensations, but there’s something about how Space Mountain locks it up in one room that gives it a concentrated intensity. Disneyland is great no matter when you’re there, day or night. But there’s an added pleasure that comes from being in the park all day, becoming accustomed to it looking a certain way, and then seeing how it transforms with nightfall. I especially like it when the transition is sudden instead of gradual, as can happen if you get in a line that’s so long you completely miss dusk. If you want to experience this great Disneyland moment, hang around one area of the park while it gets nice and dark (Adventureland and Frontierland are my favorites for this purpose), and then walk out to the main plaza (Walt and Mickey circle) and treat yourself to the visual spectacle of Disneyland by electric light. The bright and cozy glow of Main Street is to your right, the spectacularly illuminated Sleeping Beauty’s castle is to your left, and across the way is the chaotic and multi-colored craziness of Tomorrowland. You won’t be disappointed. As an added bonus, some of the rides and attractions benefit from the sun’s sack time, too. The exterior of “It’s a Small World” is infinitely enhanced by artificial lighting, the Haunted Mansion takes on a slightly spookier tone, and the walk through Adventureland gains an almost authentic feel. And in case you didn’t know, the only way to go and possibly enjoy Storybook Gardens is at night. And then there are the parades, outdoor shows and fireworks displays. Yep, there’s a lot to love about Disneyland at night, enough for one moment, and maybe more. 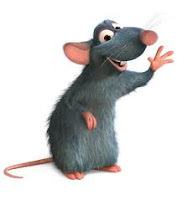 Ratatouille taught us that food connects us to our memories in powerful ways, and also that rats should be in greater demand as chefs. I would be remiss if I didn’t include food as a great Disney moment, not because they allow rats to do the cooking (I don’t think they do; but after all, this is Disney), but because of the high correlation between Disneyland and good memories. Unfortunately, I realize that ‘food’ is a pretty broad category. But the truth is, when you go to Disneyland, you’ll probably eat something really good, and it will seem even more special in that moment than maybe it would be, say, served out of the back of a slowly moving van in an iffy neighborhood. 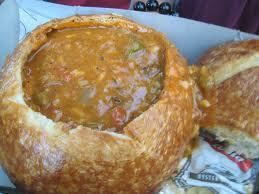 For example, Elizabeth loves the Mickey ice cream bars and the sourdough clam chowder bowls. Every time we go, she makes a point to have one of each. In reality, they’re probably no better or worse than an average ice cream bar or an average sourdough clam chowder bowl. 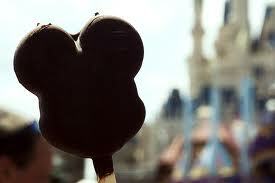 But for her, they are the taste of Disneyland. For me, every trip it seems like it’s something different. This last time it was the apple fritters. Oh my gosh, they were the most delicious things I had eaten in forever. 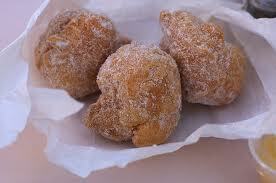 Three fried balls of dough, coated with powdered sugar and served with a small cup of creamy apple filling. It was heaven. It was bliss. It was heavenly bliss. And very reasonably priced: three-fifty for a bag of three, which makes them about the cheapest things to eat in the entire park. To experience this moment, experiment a little, find something delicious, and then sit down and enjoy eating it. Moments like this become memories you can taste. In school, when it came time to multiply fractions, we learned the terms ‘lowest common denominator’ and ‘highest common denominator.’ Having recently been to Las Vegas, I was well-acquainted with the lowest common denominator (LCD). If you want to understand the concept of the highest common denominator (HCD), at least as it applies to places, go to Disneyland. If you are even primordially observant, you will notice the striking difference. In terms of moments, this one doesn’t belong to a certain place or time, or to a specific ride, but can occur anywhere and at anytime. 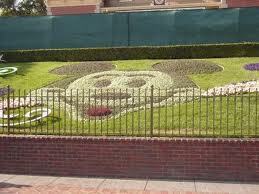 There is something amazing in the way Disneyland affects people while they are here. People willingly play by the rules, take turns, share, and are often genuinely courteous; it’s like being on the best-behaved playground you could ever imagine as a kid. Something about the place obviously means so much to the vast majority of people who go there that it seems to naturally draw out our highest common denominator. It’s as though you get a better version of people while you are there. Of course there are exceptions. There is that ever-present segment of the population that is so locked in on their own narrowly selfish worldview that they can’t appreciate the specialness of what’s going on around them. And there will be times when you might get pushed, or someone might step in front of you, or you might get a crazy look; after all, there are tens of thousands of people milling around at any given moment. The difference is that when these things happen, they tend not to be interpreted as challenges, or intentional acts of disrespect, but are taken as accidents, or miscommunications, or the result of being worn out by too much fun. Maybe it’s simply because neither party wants to waste any of their precious Disneyland time on pointless confrontations. I like to think it’s something deeper than that. Whatever the reason, Disneyland is the place to go if you want to know what it’s like to live in a world where people still give each other the benefit of the doubt. And there will be a moment while you’re there when you will realize this. Maybe it’s when you remember that you left your camera sitting in the baby stroller parked in the midst of thousands of strangers and it’s still there when you return forty-five minutes later, or maybe it’s when a someone offers you their FastPasses because they have some extras, or maybe it’s when you see someone chase down a kid to return the Buzz Lightyear doll they unknowingly dropped somewhere in the teeming multitudes. Maybe it’s something you notice gradually, or maybe it hits you all of a sudden. However it comes, when it comes, you will have experienced what I consider to be the best of many great Disneyland moments. 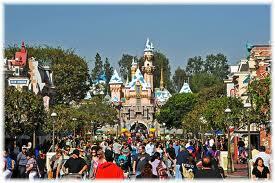 Well, there it is, my list of 10 great Disneyland moments. Agree? Disagree? I’d love to hear about it in great detail. I love hearing about the Disney Love! Your statements about human behavior while within the Disneyland boundaries are so true, I know I am different when I set foot there, it changes me! Maybe the parking lot is drugged like the field of poppies in the Wizard of Oz. I know the feeling for me is not just because of the spotless sidewalks that don’t have gum spackled on them, the lack of garbage on the streets or graffiti on the buildings and the pristine cleanliness… but I am happy when I’m there. Simple as that. A whole heart full of happy. I’m more attentive, more appreciative and more patient (which come to think of it, also makes me a much better parent when I am there too). I wish I could bottle up that feeling and take a little gulp of it now and then. Our last trip wasn’t quite as picture perfect though. We got a scowl from the cleaning man at the Pringle crumbs my daughter made after dropping one on the ground and stepping on it. If I had a broom and dustpan I surely would have cleaned it up myself! My verbal apology even did nothing to soften the glare. And the attendant who yelled at my son for causing a traffic jam in the bumper cars because even though he generously met the height requirement to ride by himself, was obviously ill prepared and lacking adequate training in bumper car maneuvering. I’m pretty sure the happiest place on Earth covers California Adventure too, but I guess those workers missed the memo that day. Oh wait! They ARE human, let me not forget that. Those are the only two instances though that have managed to puncture my Disney euphoria, and my hundreds of other pleasant memories more than patch them up. On my top 10- churros! Lots and lots of churros! I’m sure they are no different than the kind you find at Costco, but for some reason they taste infinitely more special! Yeah, it's almost like they have some kind of secret behavior modification technology at work, whether it's poppies in the parking lot or subliminal messages in the music or hashish in the churros. Hey, maybe that's why the churros are so yummy! Thanks for sharing. You have improved the blog with your great comments! 1. When I was younger, it was the sudden appearance of the Matterhorn towering above the Anaheim skyline as you are driving toward the park. All your anticipation would bubble up and there would be screams and squeals of delight. 2. 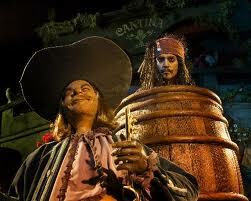 I would agree with you, the musty smell of the Pirates of the Carribbean ride is unmistakeable. If I smell something similar anywhere else, I always think of that ride. 3. The details in the park. Who does it better than disney? Who can't say they notice something new everytime they ride the Haunted Mansion? Who hasn't been surprised to suddenly see miniature mickeys imbedded into what looked to be just a normal wall from a few feet back? Or, the hidden pictures, eveil queens, swords in the stone, snoring bears, buzzing bees, etc. These things are all over the park and add so much to the atmoshpere. Or how about the snow that falls over main street at christmas time and the music that plays all over the park? 4. Seeing an actual live racoon and her babies walking along the bank of the rivers of america. Cool. 5. The fun of trying to outsmart the "Crowds" Gods and picking the best time to go and then the gloating that follows when you have succeeded in picking just the right time of year - one where you got to go on rides over and over again without waiting in line! 6. The time the Haunted Mansion broke down whil I was in the graveyard. It was off for five minutes and the lights came up. It was cool to see what it looked like and didn't diminish the impressiveness of the ride a bit for me. 7. Speaking of the Haunted Mansion, there was the time when they actually had live people dressed in costume in the ride. I can't forget the jump I and my friend had when the suit of armor lunged at our car. 8. 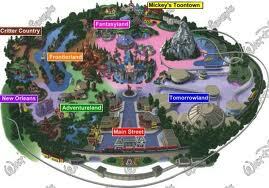 And finally, memories of friends and family associated with Disney. My first time at 11 years-old when I was sure we would never get back again. My Dad "convincing" me to get on the matterhorn for the first time by peeling me off the tree I was grasping and forcing me to go. I've never looked back and love roller coasters to this day. All the friends I have attended with and new ones I met at the park, even up till this recent trip which, inspite of E's need to speak with an English accent, and K's almost orgasmic gushing over the fritters, was still one of the best times I have there. I look forward to the creation of many more moments. Awesome list! Thanks for improving the blog! Especially love #5. Well, at least when we guess right!